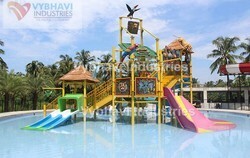 Acclaimed in the industry as a manufacturer, supplier, and exporter, we are engaged in providing Multi Purpose Water Play System. Our offered systems are manufactured with the support of advanced machinery and technology that are installed at our premises. Can withstand in extreme weather conditions, these systems are widely demanded across the global market. Our offered systems are designed and developed keeping in mind the requirements of esteemed customers to attain their maximum satisfaction. Backed by a prolific team of professionals, we are able to offer quality Multi Purpose Water Play System. These are made of 3 Platform, One Hexaganol & 2 square. 5 nos of Slides from 4ft, 8ft & 14ft. All water features like Tilting bucket, rotating wheel, Tilting cone & water spouts make are more thrilling. Jungle theme also added to this makes more attractive. We have obtained a remarkable state in the industry by offering a unique collection of Theme Aqua Play Station first choice of kids. 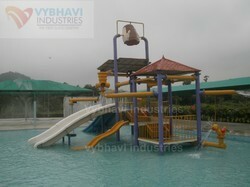 Looking for Multi Purpose Water Play System ?